In 1977, My mother, Marian DiVittorio was diagnosed with breast cancer. After much anguish, she made the difficult decision to heal herself without pharmaceutical intervention. She began the "Gerson Program," and nutritional supplements, herbs, spiritual guidance, energy healing and dream work. My experience with food as medicine, the healing power of herbs and movement led me down the path to becoming a practitioner in the Traditional Chinese Healing Arts. I began this program 17 years ago at Norwalk Community College Extended Studies Division, then to the New York Open Center, and now I have partnered with the greatest teachers in Traditional Çhinese Medicine and the Taoist Healing Arts creating the most comprehensive Health Coaching Program today. The Five Element system of Chinese Medicine was developed by ancient sages who gave more attention to restoring the health of the body with herbs and healing foods and less attention to the treatment of disease. Their observations developed into a time-honored tradition of complete health care that has diagnosed, treated and prevented illness for well over 3,000 years. Many formulas and strategies have been verified by modern day scientific studies resulting in both interest and confusion surrounding the diagnostics and terminology unique to these teachings. The sages of ancient times emphasized not the treatment of diseases, rather the prevention of its occurrence. To administer medicine to disease which has already developed … is comparable to the behavior of one who begins to dig a well after he has become thirsty…… Would these actions not be too late? Su Wen, Yellow Emperor’s Classics. 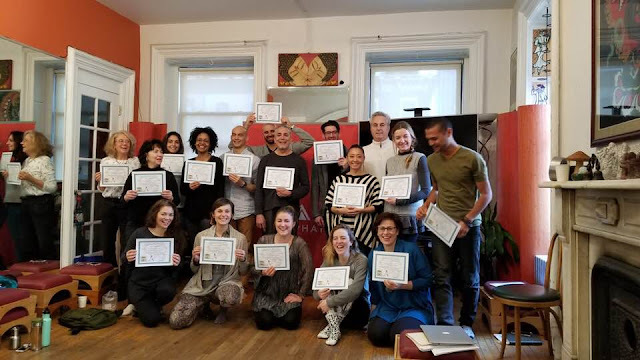 The New York Herb School offers professional training programs in Classical Chinese Herbal Medicine, Oriental Dietetics and a Certification as a TaiQi Instructor, developed for healthcare practitioners and lay-students seeking to incorporate herbs and healing foods into their clinical practice or daily lives. Our program in Classical Chinese Herbology and the Taoist Healing Arts encourages people from all walks of life—medical professionals, laypeople, nutritionists, trainers, counselors, massage therapists and more—interested in improving their personal health and the health of their clients. Moreover, our training programs were created with an accessible format of classes meeting one weekend a month and includes both academic, online and clinical training in diagnosis, food therapy, and herbal treatment. If you are a healthcare professional our programs are designed to de-mystify Chinese Herbalism and Oriental Dietetics for the western practitioner and give a working knowledge of terminology and protocols that can be successfully applied to complement your healthcare practice. You can take individual classes or join the full program. 2. The Tao Basics - Taoist Healing Practices and Theory. The 5- Elements, The Tao of Sexual Wisdom. 3. Diagnosis - The intense study of signs and symptoms. (Pulse, tongue, face, and eye reading, 5- Element diagnostic patterns, and symptoms of the organ systems. 3. How to create a personalized diet program based the signs and symptoms of your client. 4. Cooking Classes - recipes for the 5-Elements, Food Cures for specific ailments, seasonal cooking, and recipes to support chronic illness. 6. Learn the latest plant medicine trends, Macrobiotic, the Gerson Program, Gluten, Sugar and Dairy Free, Vegan, Juicing and Sports Performance. 4. The modern research of each herbal formula will be discussed. 1. 80 hours of Student Clinic The school curriculum offers a hands-on clinic every weekend that we meet. You will be working with 80 different clients learning to diagnosis and the art of creating a treatment strategy which includes, foods, herbs, and tai qi and qi kung. 1. Our program offers an assistant teaching certificate in the Tao of Internal Exercises. You will learn Tai Qi, Qi Kung and the 6 Healing Sounds to support the healing process. 1. Herbal Medicine making class; learn to make tinctures, topicals, and herbal tea. 2. Field Trips: Mushroom foraging, herb walks, botanical gardens, etc. This one-year program was created with an accessible format of classes meeting one weekend a month and includes both academic, online and clinical training in diagnosis and herbal treatment. The Five Element system of Chinese Medicine was developed by ancient sages who gave more attention to the health of the body and less attention to the treatment of disease. 12-weekend workshops: 10:00 a.m. – 4 p.m. Auditing with instructor’s permission is $300 per weekend. Please, e-mail(contact form in the navigation bar above) if you have any questions. Payment: payment options are available. The strength of Chinese herbal medicine is the concept of balance. In Chinese medicine, we learn to apply herbs according to their energetic effects on the body to help achieve balance. Using herbs energetically requires understanding the four energies, the five tastes and herb categories. During this “plant walk with slides” we will discuss chemical constituents; types of formulations; patent herbal medicines; dosages and contraindications for approximately 60 medicinal herbs. SUNDAY AFTERNOON: MEDICAL QIGONG – Connecting with our Inner Healer The internal material arts coordinate slow movements with deep breathing and promote health by moving and strengthening the “qi” energy of the whole body, mind, and spirit. With practice, one understands the innate healing energy that exists within each of us. Qigong is recognized for helping to heal a wide variety of chronic health conditions by increasing strength, flexibility, balance, circulation, concentration and relaxation. Balance in a diet is unique for each person, and there is no one diet for everyone. Learn how to use whole foods “as medicine” to balance and regenerate internal organs and strengthen the immune system to help prevent disease. The Taoist way and the healing properties of whole foods, essentials of nutrition, food energetics, dietary guidelines, elimination diets, five-phase cooking and specific foods for organ imbalances. The liver stores blood and maintains the smooth flow of qi energy. Discussion includes the “harmonization theory” and common syndromes of the liver; symptoms of imbalances; formulas & diet strategies for nervous system disorders, allergies, blood disorders, anger, depression, aggression, menstrual irregularities, learning disabilities, alcoholism & addiction and the benefits and basics of a detoxification program. From Menstruation to Menopause Chinese herbal theories and strategies for the changing seasons of a woman’s life that promote wellness and address specific health concerns including Inflammatory diseases, menstrual disorders, libido, infertility, pregnancy, and menopause. The imperial secrets of the Immortal Sisters of Taoism for optimizing vitality will be woven through this workshop. PHARMACY: THE ELEMENTS OF HERBAL MEDICINE MAKING this is a hands-on workshop where the traditional preparation of herbal medicine is taught. Herbal medicine making is a holistic art involving time-honored methods developed over the centuries into the processes used today involving both art and science. In this workshop we will learn the techniques for extracting the healing constituencies of plants in different menstruums; how to do an herb press; how to prepare herbal infusions and decoctions; how to make capsules, pills, poultices and healing salves for external application. We will explore many resources and gain hands-on experience in making our own herbal remedies. The concept of kidneys goes beyond that of western physiology and includes the bones, marrow, hair, ears and adrenal glands. Also known as the root of life, this system is the storehouse of “qi” energy and the root of yin and yang. Common syndromes of the kidney system and some symptoms of imbalance: adrenal function, bone problems, ear infections, bladder infections, hormone imbalances, reproductive imbalances, premature aging, and excessive fear. Insecurity and poor growth and development. The function of tonic herbs for healthy aging, increasing energy and managing chronic illness also included. Calming the Mind and Balancing the Spirit The heart governs the blood vessels and promotes the smooth circulation of blood throughout the body. It also houses the Spirit. The heart relies on other organs for its nourishment and energy, so the great majority of heart problems are caused by imbalances in other organ systems. Symptoms of heart-mind imbalances include loss of memory, poor circulation, confused speech, mental depression, anxiety and heart disease. Blood disorders affecting the heart and diet and herb strategies for healing imbalances included. This introductory course teaches you simple, powerful skills to balance the body’s natural energies to ease physical pain. Touch for Health Kinesiology is a safe and practical touch-healing system that is a combination of the ancient Oriental principles of acupuncture and acupressure massage with recent western developments in health care. SUNDAY AFTERNOON: MEDICAL QIGONG – Connecting with our Inner Healer The internal material arts coordinate slow movements with deep breathing and promote health by moving and strengthening the”qi” energy of the whole body, mind, and spirit. With practice, one understands the innate healing energy that exists within each of us. Qigong is recognized for helping to heal a wide variety of chronic health conditions by increasing strength, flexibility, balance, circulation, concentration and relaxation. Theory will be applied in the hands-on application of Chinese diagnostics, practice, under supervision, differential diagnosis to assess health conditions, case taking and making practical herbal recommendations. There will be a small group discussion of each case study. Resources and opportunities for continued studies. Drew DiVittorio is a nutritional consultant who maintains a private practice in Chinese Medicine and the Taoist Healing Arts. He is currently the founder and primary instructor at the New York Institute of Herbal Medicine & Nutrition, a one-year professional training program in classical Chinese herbology and nutrition. Drew was an adjunct associate professor at the University of Bridgeport Acupuncture Institute for 10 years, is currently on the teaching staff at the New York Open Center, and teaches in the Green Medicine program. He lectures nationally on nutrition and Chinese medicine and has been featured on Good Day New York, Fox News Channel, MSNBC, and Alive & Wellness with Carol Martin. Drew is also a popular speaker at colleges, hospitals, senior communities, and Fortune 500 companies. His speaking credits include Xymogen, Metagenics, New York University, Mount Sinai Hospital, New York Medical College, Pacific College of Oriental Medicine, Ronald McDonald House and Gilda’s Club. Richard Anton Diaz the Director and co-founder of the Traditional Chinese Healing Arts Academy. He is a certified teacher and educator in the Universal Tao system founded by Master Mantak Chia and is also a certified with the Trinity School of Natural Health as a Professional Health Coach and Practitioner. Additionally, he is the North American representative for Alphay, a Chinese-based world leader in organic medicinal mushrooms that are formulated in the 5 Element system of traditional Chinese medicine. Anton provides the basic QiQong and Tai Chi practices as well as the Taoist healing arts training which include both Six Healing Sounds and Inner smile, the Microcosmic Orbit, s well as the solo Sexual Cultivation practices known as the Healing Love. Refund Policy: A full refund, except the deposit, is given if notice of withdrawal is received prior to the first class. There are no refunds after classes begin and students are responsible for the full tuition. If you must be absent for a scheduled workshop there are no refunds. Make-ups are possible the next semester. It is possible to audit the class you missed the next semester. Some classes will be audiotaped with the instructor’s permission. Call or email for an interview or for more information at info@professordrew.com or call us at 917-582-3739.